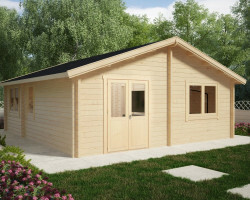 Our largest log cabins are made for people who are looking for a temporary home, a holiday home, large summer house or a very large guest house for a very reasonable price. 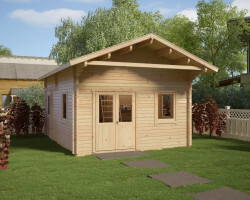 All of these log cabins are supplied “ready to fit“ interlocking tongue and groove wall planks, double glazed windows and doors, internal doors, roofing boards, floor boards, all fixings, storm braces and other necessary components to have your log cabin built. 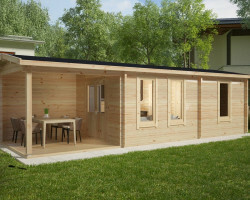 These log cabins can be easily installed within 3-6 days. 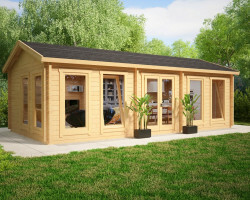 Addititional roof and floor insulation are both recommended if you intend to use your cabin in the winter months as well. 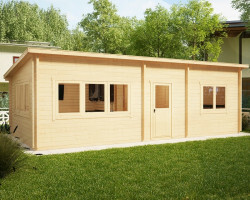 In our “Log Cabin Summer Houses & Holiday Homes“ category you can find buildings from slightly over 20m2 up to 70 – 80 m2 or even larger buildings. 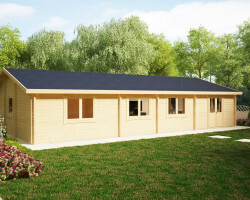 These one, two and three bedroom log cabins are ideal holiday homes for smaller families or a group of 3-5 people. 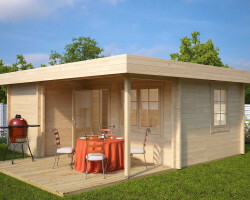 Each log cabin also has a corner to set up a small kitchen, living room area and a separate W.C. / shower room. 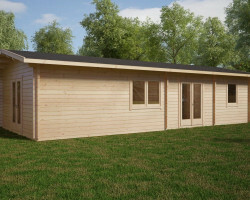 Many of our customers also use them for temporary accommodation purposes while building a new home or renovating and keep these cabins for rental or ancilliary accommodation afterwords. 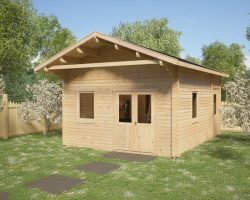 All of our log cabins are made of the finest sustainably sourced Nordic spruce, which is one of the best timbers to use. 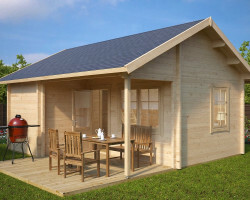 Everything you need to build your log cabin is included in the standard kit. 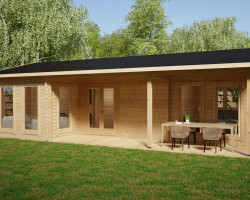 Our large log cabins come with 70mm and 92mm thick wall planks. 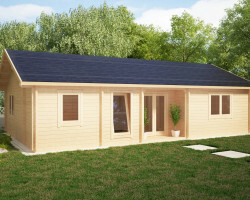 When choosing between 70mm and 92mm log cabins, besides the thicker walls, 92mm log cabins have our “Living“ series doors and windows. 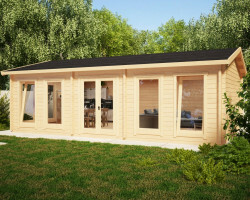 Our 70mm cabins come with “Summer Plus“ line doors and windows. 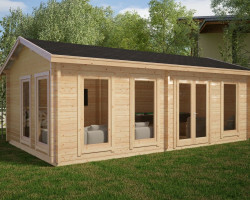 Our “Summer Plus“ windows are double glazed windows (2 x 3mm real glass) with aluminum water lath, sealed and made of Nordic pine. These offer superb functionality and insulating properties for the 70mm cabins. 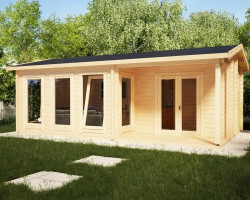 Our “Living“ series windows and doors offer not only superior thermal insulation but also functionality. These windows have German made Roto “Turn & Tilt“ systems, multi-locking points for added security and 4-18-4mm double glazing. 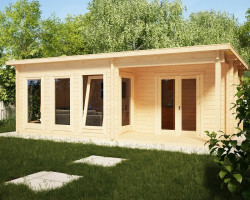 These windows have better thermal insulation than many homes in the UK, Germany and Austria! 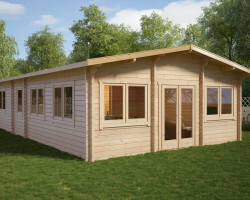 Building one of our summer houses or holiday homes from our log cabin kits is a fairly simple task. Levelled concrete base must be laid before the log cabin assembly can start. 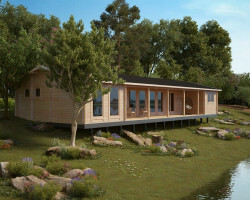 Water supply, sewerage and electricity must be planned accordingly to the cabin plans and all other circumstances. 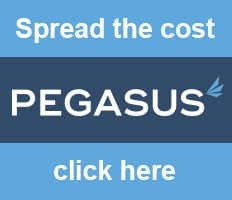 It is probably best to get these tasks done by a specialist local construction company. Impregnated foundation planks (included in the standard kit) must be placed on the base and screwed to each other and fixed to the base. Next step is to build up the walls from interlocking tongue and groove planks. Then install the roof joist and nail the roofing boards. 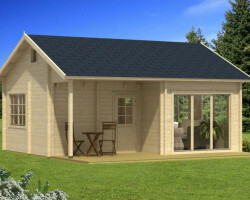 Cover the roof with roofing felt (included in the standard kit) after you have installed the roofing boards. Now the building is protected from sudden rain. 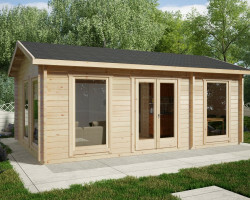 Exterior windows and doors can be installed next, then the floor boards and finally interior doors. 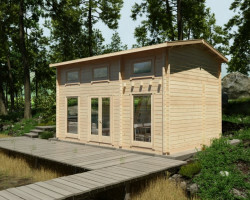 This is mostly 3-6 days task to have your log cabin built. 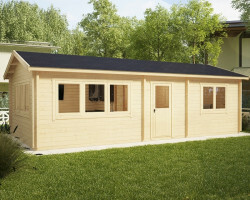 All our large 70mm and 92mm log cabins have a 5 years factory guarantee, but with proper care they will easily last for a life time.